Great Nappy Change Event This Saturday!! 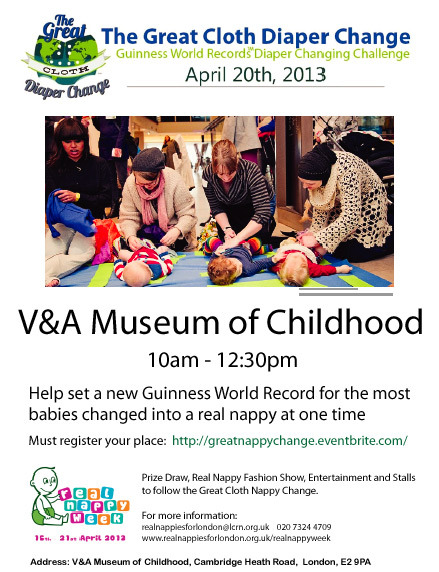 Come and be part of an attempt to join the Guinness Book of Records for the most babies being changed simultaneously. This international event will take place simultaneously all over the world but where better to take part than the Museum of Childhood?! Come along and celebrate real nappies! Nibbles, entertaining and interesting stalls will be provided, you just need to bring your baby, real nappies and a changing matt. After the Great Nappy Change a small Real Nappy Fashion Show will take place, if you would like your child to take part please make sure that you specify when registering. There will also be live music, dancing and games, plus a prize draw. 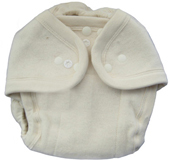 Categories: Real Nappies, recycling, waste minimisation | Tags: real nappies for london | Permalink. Come and be part of an attempt to join the Guinness Book of records for the most babies being changed simultaneously. This international event will take place simultaneously all over the world but surely there is nowhere better than the Museum of Childhood to be part of it. Plus it will be a great chance to socialise and celebrate that real nappies rock! After the Great Nappy Change a small Real Nappy Fashion Show will take place, if you would like for your kid to take part please make sure that you specify it when registering. The Museum will have life music, dancing and games to celebrate St George’s Day, so it can be the perfect family day out. There will also be a prize draw on the day amongst everyone taking part! Categories: Real Nappies, recycling, waste minimisation | Tags: real nappies, real nappies for london | Permalink.